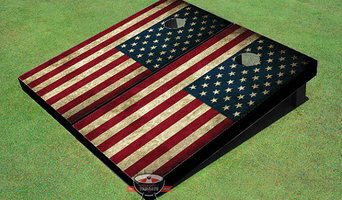 Founded in 2008, Victory Tailgate is the largest manufacturers of custom tailgate games in the United States. Victory Tailgate prides itself in its products having the highest standards of quality and durability, along with unlimited graphic design and customization capabilities. 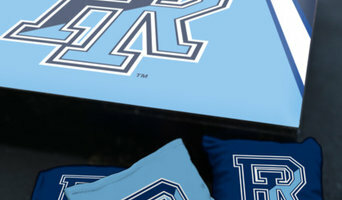 All Victory Tailgate tailgate games are 100% designed, manufactured, and shipped from our Orlando, Florida facility. Victory Tailgate is proud to be licensed partners with over 600 colleges, major professional sports leagues, and numerous iconic brands. Victory Tailgate is committed to keeping manufacturing in the United States. All American Tailgate is family ownered and operated in central Florida. We consist of highly qualified personnel who take pride in their work to deliver a superior product every time. Our company uses the highest quality materials to manufacture our products including the corn filled bags in our shop. It’s for this reason we are able to have a lower price point than our competitors, while maintaining, a high quality product. Our quality control starts with our boards being constructed in our shop, ends with the boards being packaged and then shipped off to our customers. The person who built your boards won't be the same person who paints them. We don't advertise "midwestern craftsmanship" and then import our boards or get them from a 3rd party builder. We take pride in the work we do and strive to make sure our customers are 100% satisfied with the product they receive. Atherley Law is currently Florida's #1 Immigration law firm. Additional specialized practices areas include: Family Law, Personal Injury, Mediation, and more. At the Atherley Law Firm, we are committed to developing solid relationships with our clients. We pride ourselves on having a relationship oriented and client-centered law practice. Our mission is your success! Website: <a rel="nofollow" target="_blank" href="http://www.ifixit4u.co">http://www.ifixit4u.co</a> Address:111 N. Orange Ave Suite 814 Orlando FL 32801 Email : support@ifixit4u.co Phone : 407-505-6404 iFixit4u is company who comes to you for any type of Cell Phone Repairs, Tablet Repairs or Computer Repairs. We offer affordable prices and Original Parts and a 6 month warranty with any repairs. 24x7 Locksmith Support in Casselberry, FL If you're searching for a Locksmith company in Casselberry, FL, you've reached the right place. We, in Casselberry Fl Locksmith, work with skilled, solid and legitimate technicians that will actually give you the ideal assistance you may get. bet365 kifizetés módok - A bet365 oldalon talált nyereményszorzók átlagosan a legtöbb mérkőzésre és bajnokságra vonatkoznak. Kivételeket a Premier League és a Bajnokok Ligája mérkőzései játszanak, ahol a visszatérés magas, így a bet365 a legmagasabb meccsfogadók között található. For a more grown-up play area, a tennis court, netball court, basketball court, or any other sports court, is a great way of utilising outdoor space to exercise, practice your hobby or start learning a new sport (in the privacy of your own home!). Tennis court construction in Orlando, FL doesn’t have to be as cumbersome as it sounds when you hire a sports court designer. They will handle all of the design, logistics and tennis court installation, liaising with you every step of the way, in order to put together your dream outdoor sports area. Why would you need to hire an Orlando, FL sports court specialist? Tennis court installation can be very technical; there are many materials, measurements, specifications and technology to consider and it is not a project to take on lightly. The same goes for other sports courts such as netball and basketball courts, football pitches and golf courses, but by hiring an Orlando, FL professional who is experienced in sports court construction, you’ll feel much more confident when building your outdoor sports area. 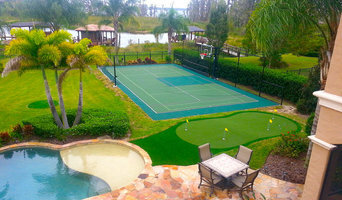 Hiring an Orlando, FL tennis court construction or other sports court specialist who has worked on similar projects to yours is always important, but with sports court builds it is especially essential as it means the professional will be familiar with national regulations, standards and rules for tennis court installations and other sports fields. If you want to give your children a place to play that rivals the local playground, then you can talk to Orlando, FL playground designers and contractors who can provide you with playground equipment and will install a fantastic playground design catered to your children’s requirements and preferences. A playground designed by a professional will be safe but fun, and will usually outrival any shop-bought climbing frame or higgledy-piggledy DIY play area. Why should I use an Orlando, FL professional to build my treehouse? What questions should I ask an Orlando, FL sports court or outdoor play equipment designer? Narrow your search in the Professionals section of the website to Orlando, FL sports courts or outdoor play equipment. You can also look through photos to find examples of Orlando, FL tennis court constructions, playground designs, treehouses and climbing frames that you like, then contact the contractor who worked on them.